I have realised that there are a few things missing on the Gurney GT40, like a windscreen wiper and the small fins on the hood. However, I will leave those for now and get on with the next kit while I am in the mood. This time, I am doing a racing saloon car. 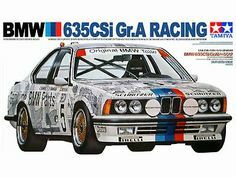 - a BMW 635CSi Gr.A Racing from Tamiya. This is the one where the decals on the outside show what is behind the panels. Looks like a fun car to decal. First off, I sprayed all of the main colours; i.e. white, black and aluminium.That done, I spent this afternoon and evening putting the chassis together. A little bit of touch up on the detail makes all of the difference. One forgets how good Tamiya kits are until a new kit is started. This one has gone together without any effort, filler or sanding. It is a dream of a kit (and I have a second one in Jaegermeister colours so that is good!). the best way to show you the progress is with a few images. My next step is to build the interior. I am enjoying this. It is much more fun than a short run aircraft! Can really be that long?